If there's anyone else the Japanese audience waited for with more eagerness, I don't know who that is. It's Yuzuru Hanyu, the Olympic Champion, World record holder in SP, FS and cumulative scores, who's performing in his homeland. As a matter of fact, he's from Sendai, which is not far from Sapporo, on the same island of Hokkaido (some seriously skewered geography here, I know). 4Lo, great! 4Sal, beautiful! 3F. One more 4Sal in the second half of the programme, deep into the second half of it! He didn't succeed with it, so the jump will have a lowered base value. What is Hanyu coming up with! 4T! Four quads and three done cleanly or very cleanly! 3A-3T in the second half of the programme! (after Yuzu doubles his salchow) Even Hanyu lacks strength a bit sometimes. 3Lz right at the end! Hahyu is stunning even even when he falls! He does something incredible! Not long before the beginning of NHK Yuzuru said he felt ready to reach 300 points in his score for two programmes. So if we remember how well he skated in his SP, we'll find out he got 103.89 points, which means he has to get a little over 196 to get to that phenomenal mark. Judging by his technical marks he might well do it, since this is his home GP, home stadium, home audience, home ice. The love of home audience can produce miracles with Yuzuru. Well, yes, he didn't manage to land his second 4Sal, and since it had to be in a combo - you can't repeat the same jump solo, one of them has to be in a combination, that's why its base value will be lowered, -4 and a deduction for the fall. But even without that jump Hanyu is just brilliant: 4 quads, 3Lz right at the end, wonderful spins, step sequence... Where does this delicate and outwardly frail young man take his energy from? There, he touched his talisman, the yellow Winnie the Pooh, for luck and set off to make history for the umpteenth time. It's just unbelievable! Now I'll get down to calculations to see who's going to the GPF - Javier Fernandez, Patrick Chan, Shoma Uno and now Yuzuru Hanyu - the four of them are going there. We have the only skater left - Nathan Chen, who was fourth in France, so he has to finish second here to get to the Final. Then he edges out Adam Rippon, but Rippon will go to the Final, but Boyang Jin will be left at home. If Chen comes third or lower, Boyang will go to the Final and Nathan will be left out, just like Sergey Voronov. Can you imagine that - even Voronov had a chance, albeit thin, to go to the GPF. But it was highly unlikely because for Sergey to get to the Final, Hanyu had to finish outside the six top men here, which is improbable. So far we've enjoyed the best part of Hanyu's performance (he goes over his calculations again!!!) There comes the score! Oh yes, yes! Yuzuru Hanyu gets 300 points! 197.58 and over 301! 301.47 is the score Yuzuru Hanyu gets! He said he would do it, and he kept his word! It's not hard to guess who's going to close the gala. In Japan, there's emerging a cult of Yuzuru Hanyu - now, perhaps, even Japan's darling Mao Asada might not be able to compete with him. Hanyu's fantastic, what can we say. He came up with incredible performances in Japan - they weren't faultless, but given the difficulty of men's figure skating, every single male skater can make mistakes. 11.11.11 - Moscow time when the music for Yuzuru Hanyu's Ex ended. It looks symbolic, if one looks at the row of these ones. Perhaps Hanyu will be able to win all the six competitions he wants to take part in this season? He's failed once already - Patrick Chan won SC, but the GPF and Japan Nationals and World Championship are still ahead. Perhaps, he could also want to take part in the 4CC, but I'm not sure Hanyu will want to have such a tight schedule for competitions. This Ex number with Notte Stellata by Il Volo was choreographed by David Wilson, but the music was suggested by none other than Tatiana Tarasova. It's interesting that this year Hanyu has worked with three different choreographers - Geoffrey Buttle created his SP, Shae Lynn Bourne his LP and his Ex was made by David Wilson. Now we'll see what the Olympic Champion is going to show us during his encore - Prince or something more traditional local Japanese melodies. No, it's his SP. Gr: We just have to see one more SP on this first day of GPF competitions - the SP of the Olympic Champion Yuzuru Hanyu. He turned 22 just a day before the start of the competition. TAT: Oh, he held on! Oh, what a man! 4Lo. TAT: What a stunning glittering costume which keeps changing its colour slightly all the time - apart from everything else! Gr: Hanyu is as fantastic as Prince to whose music he's skating. GR: Hanyu is capable of surprising even you? TAT: Yes, since it's new, remade. He's got no problem with putting his foot on his head! Bravo! Just bravo! The audience is on their feet, bravo, and I'll stand too, I think. What a delight! Gr: it was worthwhile waiting for this and watching all the other events, supporting (your favourites) and getting nervous. I was watching the audience - they were in an uncontrolled frenzy watching the last 30 seconds of what Hanyu was doing on the ice. There's an incredible number of toys and flowers on the ice. The Japanese fans came here just to watch this. TAT: It's fantastic! What a program! He looks stunning and free while skating it! He's very talented! Now he's filled up - he used to be very thin, he used to be just a little boy! One could see that he had an enormous talent. The Japanese always get these incredible skaters. Look, his push-off from the ice wasn't good, but he still made it! He still held on! What nerves he got that jump through with, but he didn't just give up on that jump! And here he does (the combination) in just one touch, not one redundant move, no move for getting ready for his second jump in the combination, he's just ready to jump it while he's jumping the first jump. Very flexible - well that's what he was born with. There's he's jumping off a rocker. Here, this thing stunned me - not that he put it on his head. Alexei Yagudin used to put his foot over his head in sit-spin in a similar way. But that he skated on that spread eagle, powerful, very new, all turned over - these people never stop seeking and they find something new when they have such a talented person. This is also worth a lot, the fact that he always bows to his coach. Gr: Yuzuru has shown who's running the show today (literally:who's the master in this house), he's the only skater to go over 100, his result is 106,53. It's not his record result, but it's beyond the reach for the others. There are nearly 7 points between him and his closest competitor, Patrick Chan. TAT: He didn't skate for a while, he was getting his foot treated and there were some operations, but he has such a core strength within him, such a desire to win, not just a desire to win, but to perfect himself. Winning comes second - but he strives for perfection. That's what I can wish to everyone! The first day of men’s competition will be closed with the SP of last year’s revelation, Yuzuru Hanyu, the Bronze medallist of the World Championship in Nice. The winner of Moscow Grand Prix event last year. I remember him winning the event – he needed to win to get to the GPF. He came fourth in the GPF, then came the stunning skate at the World Championship – he won Bronze medal at his first WC. He also starts with 4T – now we’ll see this quad. You can judge by the audience’s response that the athlete has landed a fantastic quad. (in a slightly more animated manner) Well, this guy is just 17! He’ll turn 18 in December. He’s a major hope of Japanese men’s skating, with a brilliant result last season and you can feel that he’s going to surprise us quite a lot. A wonderful SP, he was so confident while performing it, he’s undoubtedly a super-talented skater. Now he lives in Canada, in Toronto. He moved there to train with Brian Orser, a brilliant coach who was once a brilliant skater himself, silver medallist in two Olympic Games, 1984 and 1988. There he is greeting his student. Indeed, it was a stunning program – let’s see: a fantastic 4T. In fact, Yuzuru (or Oozuru, as he said it) didn’t have any problems with his jumps. There you can see once a brilliant skater, now an outstanding coach applauding him. A splendid 3A impeccably executed. The program itself is very exciting, and the skater himself is both emotional and graceful (or elegant). He delivered everything in this program, so we should expect to see a high score. By the way, he received his highest score for the SP so far in Moscow – 82.78, and I’ve a feeling that this result will be surpassed now. I think two Japanese will be at the top… 95.07! Of course, I expected him to improve on his result, but to do it by so much! By more than 12 points! 95.07 – that’s a tremendous achievement! His costume reminds me of Johnny Weir. Why did you say that about him? Well, yes, he reminds me of him! So I remembered him. … he failed in his 4S – he fell. Then he fell in his 3F, so he had 2 points of deductions, though his 4S and 3F were counted in as rotated. And he had a mistake in his combination – he didn’t do 3S, in his combination 3Lz-1L-3S. Perhaps, he can have an ideally clean skate now? Oh, he made it – he held on to the jump! He kept on his feet! The quad was borderline, he could have fallen! Toeloop. Yes, he’s done the quad! The second one. Yes, he’s already doing better than at the Olympic Games in his jumps. 23.09 for just two jumps. That’s beautiful! Beautiful! He really jumps off steps – even his 3A! I think he finds it more convenient. Yes, his axel is… off a counter, isn’t it? 3A – hold on! -3T! There it is, that axel! Yes, one more axel with 2T. All the combinations are in the second half. 3Lz! – oh – and 3S! Is that real! He jumped it almost from a standstill. He didn’t do it at the Olympics, but here he did – he had to show his character and fight hard for it (‘he did it by the skin of his teeth). He’s got two spins coming. This season, he and Yulia Lipnitskaya are getting very high marks. That’s dotting his i's! (literally, that was his final full stop). He’ll receive more than 100 for TES! 101.45 is his record for his SP, dear friends. Here, he got more for his TES – he received 101.49! It’s 0.04 points more than what he got in Sochi for the whole program! His leg… Now you can see he’s exhausted. I haven’t ever seen Hanyu so tired! Has he got a cramp? I think so. He’s holding his leg. Perhaps it was his knee – he might have hit the knee against the ice when he was doing his final posture. The score is coming down – 100.84. Thank you, my mascot! (when Yuzuru shakes Pooh’s paw). … in order to hear the score! 2013 Skate Canada SP | Rus ESP. … Hanyu who became the Bronze medallist a couple of years ago at the age of only 17. He’s getting ready – he’s all turned inwards now. He’ll skate to Parisian Walkways by Gary Moore. He made it happen! 4T. Oh no! No, no, just one mistake and the program is down the drain. Yuzuru jumped only a single lutz with a triple toeloop instead of 3-3. But the way he plays with the judges and the public! (during the warm up)… now they’re showing us Yuzuru (Yuzuri!) Hanyu, Olympic Champion, current World Champion, playing an unusual part for him – he’ll be the one opening the SP because of the way his athletic fate has been shaping up this season. He hasn’t been successful in everything so far. He only just made it to the GPF at his last home Grand Prix event and his result is the sixth here. Everyone wonders what’s going on with this athlete, the Olympic Champion, current World Champion – whether it’s the natural post-Olympic reaction when the gruelling season in which he won everything in sight and was best all around is over, or it’s the response to the injury he received in the collision with a Chinese skater at CoC. But he still competed in both CoC FS and the final GP event in Japan. The SP competition will be opened by Olympic Champion and current World Champion Yuzuru Hanyu. What we will see now will give us some understanding what’s going on with this outstanding skater. His coach Brian Orser has sent him off. This skater from Japan is just 20, but he has achieved such brilliant results in his career. By the way, he’s a world record holder in the SP score - more than 101 points, his PB is 101.45. The only skater to get over that barrier of 100 in the SP. Frederick Chopin’s Ballade. A superbly executed 4T. This is certainly the best SP this season. If it hadn’t been for that fall on the 3Lz3T combination… though it was visible there when he was entering his second jump with such a lean that he was likely to fall. But anyway, how much is he going to lose there? He’ll lose something like 2 points. He was faultless in the rest of the program. Everything is level 4, all the spins are level 4, the step sequence is level 4. Every element apart from the combination received very good GOE. The art and mastery of this skater is so great than even a fall isn’t an obstacle to his getting over 90 points for his SP. I’ve a feeling that after all the troubles of this season the Olympic champion… you see here him enter the second jump in the combination there? And a fall follows. I can see his PCS now – well, he’s received more in his career, but these are quite impressive as well. The highest mark for choreography is 8.86, and the others are also just under 9. Well, he’s letting his competitors know that he’s come to win here. His SB at the GP event was 82.95, now his score will be in a different league. You can see it perfectly – he’s lost around 3 points in that fall, but the result is very impressive nonetheless. He can’t believe it himself – 94.08. Chizuru: …Jeremy Abbott is currently in 1st place, and Takahiko Kozuka from Japan is in 2nd place. The skater on the ice is Yuzuru Hanyu from Japan. He is 16 years old and this is his first 4CC. He became World Junior Champion last year. This has been his first year in senior circuit and it has been full of inspiration. He participated in his GP events for learning experience, but now he regards this competition as a field to show the fruits of his experience. Chizuru: Exactly, and we really hope he will show it to us. Chizuru: He has also equipped himself with a big gun, a quad toe-loop which he will attempt at the beginning of the program. The music is Zigeunerweisen by Sarasate. Yutaka: Excellent! It was a well-controlled jump. Yutaka: One position spin. Well executed. He went into it from a back entrance, made 8 revolutions, and after changing foot made 8 revolutions again in difficult position, so this is a level 4 spin. Yutaka: Probably planed to do triple Lutz here, but it became single Lutz. Yutaka: He is going to do another triple Axel, isn’t he? Yutaka: Triple Axel-triple toe combination. Excellent. Chizuru: Yes. That was a jump in the second half of the program. Yutaka: It seems like he has some trouble with Lutz today. Yutaka: The triple Lutz was fully rotated, but its axis was warped. Yutaka: Choreographic step sequence. …It might be a bit too simple, but he’s still young. Yutaka: Must be difficult for him to execute all these elements. Chizuru: This is his last jump. Chizuru: 16-year-old from Japan, Yuzuru Hanyu. This was his 4CC debut. Well, he looked tired, but I think he did very well. Yutaka: I agree. Yes, he did pretty well in such a big competition. He was 3rd in SP, so he must have felt some pressure too. Considering it, I think he did his best. Chizuru: We’d like to give a big hand to him. Yutaka: Lutz was his Nemesis today. Yutaka: I think I saw him popped it once in the 6-minute warm-up. Yutaka: Yes, but except for Lutz, he executed everything quite well. Yutaka: All the spins must have gotten levels, I assume. Naname Abe: Well done for the jump! Good job! Chizuru: I think he really did a good job. Yutaka: I think it’s rotated. 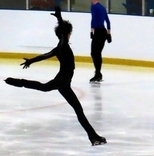 Yutaka: This is the triple Axel. Yutaka: This is second triple Axel… and triple toe. Chizuru: Yes, he added a triple jump. Chizuru: He said his first year in senior circuit gives him a lot of inspirations. He appears to be full of motivation to learn. Yutaka: He must be. He is very strong… mentally. Chizuru: *giggles* He attempted a quad jump and successfully landed also in NHK Trophy, which was his senior debut, didn’t he? Yuzuru Hanyu: Thank you very much! Chizuru: OK, his score will be announced. If his score is higher than 149.28, if he scores higher than 150, he’ll be in the first place. Oh yes, he did! Chizuru: His score is 151.58. It’s his season’s best. 78.20 (TES) and 73.38 (PCS). Yutaka: Good score in five components too. Chizuru: Yes, he marked high in five components score. Yutaka: I think his speed and energy are highly appreciated. Chizuru: His placement is also good. Yuzuru Hanyu is currently in first place. Jeremy Abbott is 2nd, and Takahiko Kozuka is in 3rd place. Someone posted a swiss italian commentary! Can anyone translate? I'm not a native speaker of Italian,but I think my understanding is good enough to provide you with a translation of this commentary.The 2 ladies who are commenting tend to interrupt one another or to speak over the other at times,they also jump from one idea to something completely different,so that's a bit annoying,but I guess I got right at least 90% of what was said.If anyone wants to make a correction or to add something,feel free to do that. - [after the 4 Lo]: Wow,great start! - Just look at the [tech] score on the screen :125.71.He did everything he wanted.He hasn't left even half of a point on the table.Everything is level 4, he did all the quads and the triples that he had planned,everything with a quality that requires an increased GOE.A super score! At the press-conference after the SP he said:”Anyway,my goal is the gold medal.” And he now has certainly put the pressure on the next competitors. - He [Yuzu] didn't do anything wrong,anything...incredible. - Chen will want to warm-up a little,these moments are very important for them.Actually he [Chen] is now already entering the ice which has not been completely cleaned yet. 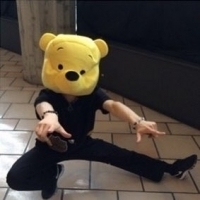 - Obviously,Winnie the Pooh which is Yuzuru Hanyu's emblematic toy. - Such an ease in executing all the elements: jumps,steps,spins,everything seems so easy.He started with a 4Lo,then a 4S,a 4S3T combo in the second half of the program therefore that will have bigger value,he also jumped the 4T,he basically jumped 3 different types of quads,one of which was repeated – the 4S in a combination. - [some irrelevant comment about Brian's wardrobe I haven't fully understood].Brian Orser now trains skaters from Kazahstan,Spain,Japan,Canada. - Yes,we've also seen him in the SP so we know that he is human. - The previous record was 219.48,he established it at the GPF 2015-2016.And now 321.59 total – he doesn't break the overall record because he didn't do that well in the SP. - Thank God for that! He's human! - Sometimes,sometimes he's human,because today he was stratospheric(out of this world). - My goodness,223.20 points! He's the first skater in history to surpass the 220 points barrier [in a Free Skate]. M: Today everything’s against him, but we are talking about an ace, an athlete that was probably born to dominate in the years to come. If I were the ISU, international skating union, I’d recalculate the scoring system based on him. We’ll see what he manages to do today, but everything is against him. Here we go; until now these world championships haven’t been amazing for Brian Orser’s pupils. [mentions Elene Gedevanishvili] There were some problems for Fernandez and problems for Hanyu. The current standing is wrong, Hanyu isn’t in first, he ended up sitting in ninth position after the short program. A: Yes, a very disappointing ninth position, but we can expect anything…fingers crossed obviously, let’s hope we’ll see a great performance, this is an exceptional athlete, his talent is crystal clear, but at the moment he isn’t at his best. M: NDP, very popular music this season. 4T! 4S, not perfect, the rotation might be under review. 3F. 3A3T. 3A2T! 3Lo. 3Lz2T2T. 3Lz! A: He’s not well, he’s in pain and I don’t know if you noticed but he simplified some details of his spins - he had planned a flying entry on the sit spin, on his next to last spin, the combination spin, but it was probably pertaining to his injured leg, so he got rid of that. He’ll obviously lose a level there, but he did the right thing. He looked to be suffering in a few moments during the program, but he gritted his teeth and performed like a true champion, with some bad landings, but he managed to stay on his feet…he completed- he attempted two quads, the salchow under review, he completed the toe, two triple axels, two triple lutz in the second half, he truly fought like a champion. And now we’re witnessing his emotions…we could have not asked more from him today. M: Six triples in the second half, two of them triple axels right? M: [4t on replay] no problem here, the rotation is complete.. A: And look at that landing, look at how he bent [his knee] he’s not new to this kind of landing. M: And the jump is worth positive GOE. Here [4s on replay] we are- A: could be underrotated; it might lack just about one quarter of rotation, but it’s not important. It’s honestly difficult to think that he might win, because he’s really far from Chan, but he can gain a few positions, and it’s important to secure three spots for Japan. M: Yes but those are a lock, this is a program that should score more than 170 points. A: Incredible. M: With two quads, two 3As and two 3Lz - and the last four in the second half, he won’t be far from 90 points of TES. A: No, right. M: True, today he’ll loose something on his spins…I’d be generous for PCS; we skated this program with him, he truly managed to get us all involved. A: Yes, he truly poured his heart in it, he gave everything…he lacked some speed if compared to other performances, he slowed down in the second half, but he wasn’t 100%, maybe not even 80, today. M: He got 85,16 PCS in the GPF A: Which is a lot. M: His best TES is 92, from worlds last year. [after the score] I expected something more, I expected above 90 of TES and…82-83 PCS. 169 and not the 175 he could have hoped for. Well, 244,99 is a score that I don’t know how many could reach. And he’s limping. A: And that’s scary. He reached an excellent score in a precarious condition. M: Hanyu reached a score higher than Machida’s only once in his career. In the GPF final at Fukuoka, when he reached 193,41…scores so huge, it intimidates us just to speak about it. A: Yes and he truly needs a performance like that; it’s difficult to think that he might overcome Machida, it’s clear that these two can try, but they’re the only ones. M: And now it’s time for the most anticipated athlete, Yuzuru Hanyu, current olympic champion, the one who dominated the Grand Prix Final and the Japanese national champioships, which I mentioned because they took place right here. A: In Saitama, venue of this WC. Hanyu is the olympic gold medalist, so he’s been obviously much anticipated. M: Let’s lay our cards on the table: the best Hanyu, the one who manages to stay on his feet from start to finish, without mistakes, wins the title, he could do it. The Hanyu we saw in the short program and in the olympic free skate wouldn’t be enough. A: Right. The first salchow is very, very important…he rarely lands it. 4S! Maybe he’s never done it that well. 4T! 3F. 3A3T…but with some problems on the landing. Marvelous second 3A, done in combination with a 2T. Beautiful 3Lo. 3LzLo3S! Incredible, in spite of a terrible landing on the lutz. The second 3Lz was beautifully executed. Last spin. Which is the combination spin, after the flying sit spin. We’ve already reached 97,96…the meter’s running! Some problems on this flying entry, he might not reach level 4, but he should reach the level 3 and it should be enough to go over 100 in the TES. M: 101,49 - A: He’s exhausted! M: He reached 102,03 in the GPF…this is an ace. Because today he had his back against the wall. A: Yes. We’ve never seen a better 4s from him, he had to fight, it wasn’t that competition in which everything is easy. He’s tired, exhausted, but he fought through it. I’d like to see again 3LzLo3S, because listen, he landed forward, he was still and yet he did the loop, the euler, and then 3S, from a standstill. Impressive. M: And have you noticed that that single loop is called as underrotated more often than not…but for how the jump itself is done, if you think about it. A: Yeah, obviously, because of the takeoff and the landing, it often needs to lack something, sorry for lack of a better word, to attach the 3S after it. M: He obviously needs the TES not to go down, if it keeps going down Machida’s chances will be higher. A: [4S on replay] look at the quad salchow, how reactive he was to land it. M: I have to say that, by watching videos from practice, he was landing quads easily. But then practice and competition are different things. A: Yes of course. The 4T was beautiful, fantastic as usual. M: It isn’t the highest TES ever reached, because Patrick Chan reached 100,25, and Hanyu himself has reached a 102,03. It keeps going down. A: I think it’s because of the GOE, because it keeps going down, but slowly. Many elements did not have an excellent grade of execution after all. Look here. M: He’s at risk then, because now PCS will be tricky. He has to be over 92, around 92. A: Look, look here…3Lz. Ah no, don’t mind this is the solo 3Lz. Yes the solo one. Well, it was still an astounding performance. M: Yeah, nothing to say about that. You can only bow, because everything was against him today. A: Yeah, it was extremely difficult, he gave everything he had and he ended without much energy left in him. He had trouble standing, but he truly gave his all. M: Let’s remember that the Grand Slam was completeted only by Alexei Yagudin, GP, Olympic games and World Championships. Yagudin even won the European games, obviously Hanyu did not enter the 4CC. He’s alone, because Brian Orser is still besides the rink - A: Javier Fernandez M: The next one is one of his [pupils]. A: Let’s say that he has a nice little squad in the men’s field. M: Yes. And he might do the sweep, senior world title and junior world title. With the Olympic games as the topping. A: It’s enough, enough - M: By how much? A: Cents, about..20 cents, he’s in first now. M: I was thinking about 92, but 91,42 was enough in the end. A: And look at how he’s jumping! And with good reason, he managed to overcome a fantastic Machida and now we’ll have to see if Fernadez will be able to overcome the two Japanese. It’s not easy, not at all. M: But he can just try. Hanyu has an excellent headstart after his short program, over 12 points – that’s around the value of 4T2T with positive GOE, so only after not executing such a combination will he lose this headstart. Well, what will Hanyu show us today? It’s clear there’ll be two quads, but how well will he jump them? Hanyu’s got a strong layout, the layout from his last season, 4T, 4S and two 3A, speaking about the difficulty of the program. He’s also got wonderful choreography. David Wilson and Jeffrey Buttle choreographed his programs. So Romeo and Juliet, Nino Rota’s music. (Yuzu falls on his 4S) well, yes, yes. One could see at the entry that he’d fail his 4S. There he lost something – around 4 points or 5. But he lands his 4T. 3A3T. In the second half of the program. The BV is multiplied by 1.1. And one more 3A off his trademark entry and 2T with arms aloft. This seemingly slight young man has so much strength, because it’s incredibly difficult to do two triple axels in a row in the second half of the program – the muscles get tired (literally, get clogged). (After Yuzu nearly collapses after his final spin) Oh, hold on, hold on! Well! While he was doing his jumps, there were still some reserves of energy, as soon as… Is that an injury? Or has he just run of his steam? The technical score is something… 102 and more, incredible! I think the Japanese audience are being quite reserved, as such a skate deserves a much louder applause in order to put pressure onto the judges so that they didn’t have any doubt who won today, who won here in Fukuoka. Yes, it was a brilliant skate and Yuzuru Hanyu has shown us how to beat Patrick Chan. Well, we’ll wait, but honestly… he made one mistake – the failure to execute 4S at the beginning, where he lost 5 points, but that was it. The layout is excellent, just excellent! The boy is 19, he won the Junior World Championship back in 2010, so he was… 15 years old then! By the way, he’s… is it December 7th, I lost count… no, it’s December 6th today, he has his birthday tomorrow. Yes, he skated very well in the Vancouver Olympic season… they’re showing us that only mistake he made when he landed on the back side of the blade and his body went backwards o his 4S… and this is his 4T, very high quality, very well executed! Yes, he became a junior world champion in the Olympic season. He could have gone there, but he only came 4th at the Nationals, so he didn’t go to the Olympics. (hmmm, they’re confusing seasons 2009-2010 and 2010-2011 here). Next year, he was second in the 4CC and the year before last he won the bronze medal. So these are the milestones of his career, though we can also add up last year’s GPF silver medal. But I think that this year he’ll add the gold medal to that silver… we’ll wait of course, we see Brian Orser jumping for joy at the rink board because I think that Brian Orser has been doing some mental arithmetic and he knows how much his student will get for all these jumps and spins. It seemed during the skate that this skinny boy, made of iron, but the last spin showed that he was skating on willpower alone up to the last second, but he was very tired. 293.25! 193.41 for his free program, this is his personal best, and he came only 2 points behind the world record by Patrick Chan in Paris three week ago. So we congratulate Yuzuru Hanyu! Patrick Chan has failed to win his second GPF in a row – maybe he did it on purpose here, I don’t know… Yuzuru Hanyu has finished higher than him for the second time in a row, though last time there was Daisuke Takahashi, this year, Takahashi is absent, but there’s Yuzuru Hanyu who made the Japanese public happy. Announcer: Takaki Toriumi. He has been working for NHK since early 90’s and done play-by-play announcement for NHK Trophy many times. Commentator: Takeshi Honda. Former single skater. Two-time Olympian and World bronze medalist. First 4CC champion and six-time national champion. He is also the first Japanese skater who landed a quadruple jump in a competition. He is now coaching in Osaka. He had been training in Ice Rink Sendai in early 90’s with Shizuka Arakawa. Toriumi: Under Brian Orser’s watchful eyes, he psyched himself up. Here comes the challenge for Yuzuru Hanyu. In team event he impressed the whole world with his strength as the world’s top-ranked skater. In GPF held in December, he became champion defeating Patrick Chan who has been winning three consecutive world championship titles. To win an Olympic gold medal he has to take lead in this short program. Toriumi: The music is “Parisienne Walkways”. Toriumi: Here comes the opening quadruple jump. Toriumi: Hanyu has planned two jumps in the second half of his short program. Honda: Triple Lutz, triple toe loop. Toriumi: He nailed all three jumps perfectly. Toriuimi: Yuzuru Hanyu, the world’s top-ranked skater showed his toughness. Toriumi: His performance seemed almost perfect. Toriumi: The world’s highest score in men’s short program is 99.84. No one has ever gone through the 100-point barrier yet, but Yuzuru Hanyu’s performance today made us expect something like that to happen. Japanese flags are waving in Iceberg Skating Palace. He captured the hearts of Russian fans. What an amazing 19-year-old, isn’t he, Mr. Honda? Honda: He is amazing. 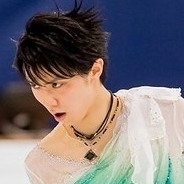 He has been really fierce in the short program all through this season. Honda: And he could perform it fiercely here in the Olympics, too. It’s incredible. Toriumi: This is his first jump. Honda: The first quadruple jump… it has good distance and heights. Fully rotated before landing. Honda: The triple Axel from difficult entry… and the triple Lutz-triple toe loop combination. Toriumi: (laughs as he sees Brian Orser jumping when Yuzuru was jumping) Yuzuru Hanyu put his palms together like he did in team event. Mr. Honda, I think he might break the 100-point barrier. Honda: Yeah, it is highly possible. Toriumi: No one has ever scored over 100 in short program… Here comes his score! Toriumi: 101.45! Finally! It’s the world’s highest score in short program! He achieved an incredible feat on the big stage of the Olympics! Yuzuru Hanyu broke the 100-point barrier for the first time in history. M: And speaking of an Olympic gold medalist, Yuzuru Hanyu. A: From a pair who is bound to r****, to someone who might dominate the field for many years to come, considering his age. M: 4 accomplishments during the season: complete supremacy at the GPF, victory at the national championships, held in this rink, winner of the Olympic title, and as a topping, a world title in his own country. It was impossible, to do better. Finally! A: And do you remember this one? M: For me this is the most beautiful of Hanyu’s free programs. Let’s watch this in reverent silence. A: Simply amazing. M: Well, we have to go back to this program, skated in Nice in 2012. With this program, with a sublime performance, Yuzuru managed to win the bronze medal [literal: this program skated in a sublime way allowed Yuzuru to win the bronze medal], behind Daisuke Takahashi, and for the first time in history we saw two japanese men on the podium. That was the start of Yuzuru Hanyu’s true story, because that program is remembered by everyone; it moved us to tears, it gave us goosebumps, truthfully it was even better than this year’s FP. A: Yes, yes, I agree. The only thing I need to say is that sometimes I still go back to rewatch it, and it still touches me to this day, just as it did then. I still have clear in my mind Yuzuru’s bewildered expression after he reached the end of it, with so much determination, while everybody stood to applaud him obviously…and after a couple of seconds he started crying, just as he realised that he had skated an exceptional program. In fact a sensational score soon followed, a score that allowed him to complete his comeback and make it to the podium. M: Yes, he was seventh after the short program, quite far behind from third place. A: Yes, truly amazing. I have to be honest, I still have goosebumps thinking about it now. M: But talking about Yuzuru Hanyu’s signature programs, there’s another, one that he has skated excellently in the last two years. Maybe he hasn’t skated it so well at this WC, but still. A: One of the few times though. And this is the short program he used in the last two seasons: Parisienne Walkways, a short program that allowed him to break world record after world record. M: Well, Mao Asada gave us a lot during her long career…it’s difficult to tell who’s the true main character of these world championships, between her and Hanyu. Let’s put them on the same level, they’re two aces, fantastic. A: yes, aboslutely. True, Hanyu did not manage to do his best in the short program, but it was followed by a textbook free. And anyway, this short program at the Olympics reached an amazing score, let’s not forget, over 100 points. Something that we could have not even imagined until a couple of years ago. Continues here (x) I translated the first 30 seconds, because I found them quite…interesting. M: And the next goal is to reach 300 points. M: Yes, exactly. And he can truly reach it, because in the short program he has already gone over 100, in the free he has already achieved more than 100 of TES and he can easily reach 95 points of PCS. If we put it all together, and he skates a perfect free, we’re well over 300. A: Incredible. He’s truly a skater from another planet. Wow, finally a bit of free time to translate some commentary, Yay ! Sooo... On the menu today, Yuzu's Helsinki SP, with the comment of french national TV. I must admit that I only watched it once, live, I had even taken a day off to watch the SP... but then couldn't watch it again for a few weeks because I was too bitter for Yuzu. Now today I'm really happy to rewatch it because the performance was great, and the commentary very enjoyable, so thank you @gladi for giving me the link :). The commentator is not our usual three clowns musketeers (they only did FP and EX), but a sports journalist named Paul Perret. I'm not familiar with him, but I really enjoyed the way he commented the competition – using a lot of pedagogy to explain the CoP to the viewers, and telling many anecdotes about the skaters. Here we are, LET'S GO CRAZY ! 00:12 The Olympic champion is on the Ice. He's been World champion, and he's the world record holder for the short program. He established it just one year ago in Boston (small error here) – 110.95 points. He knows he needs now two quadruple jumps in order to rivalise with the best [jumpers] like Nathan Chen or Boyang Jin. Or his training mate. 00:44 The music is by Prince : Let's Go crazy. 1:26 The quadruple loop. He was the first in skating history to land it. 1:54 (I really have a hard time watching this part sorry, I'm traumatized) Oow ! I really don't know how the judges are going to take the landing of the quadruple salchow into account . It's rather unconventional... even with the double toeloop afterwards. They're going to rewatch the video, that's for sure. 3:49 Ah, he's going to blame himself for that 4S landing ! (pleaaase Paul don't rub it in!!!). Well, look, he's got almost as many points than the chinese skater Boyang Jin, and he's going to have much better PCs, that's for sure. 4:03 Buuut he leaves us wanting for more ! And he leaves the door wide open to his « teammate » Javier Fernandez, to Shoma Uno, to Maxim Kovtun, to Patrick Chan ! The competition is now particularly open ! 4:20 We're going to see later the infamous 4S, which triggers a lot of reactions from you all on social networks. I'm going to explain you what happened in a few seconds. 4:33 Because as you could see, I was a bit shocked while I commented. 4:38 (Pooh on the ice on screen) He could totally open a toy and flower shop. It's always like that with Yuzu. All the rinks are warned, but it's always the same – each time there are at least twenty plastic bags full of teddy bears and flowers. It's never easy to skate just after him. Here the lucky one is going to be his compatriot Shoma Uno,. 5:24 Here, the loop. He was the first one to land it in competition, this early autumn. Also called Rittberger. I like « loop » better. 5:40 And now we're going to watch THE mistake – because there's unquestionably a mistake on the 4S combination. The landing wasn't well controled, and although there's a double jump afterwards, the judges penalize that. The fact that there is a combination is ratified, but only the first jump counts, not the second. You can't see the protocols, but I have them, and that's the explanation I've been given. It's going to be official in a few seconds. He loses points on this, of course. Quite a lot. 6:15 However look at the axel ! At these lines and extensions ! And what's fabulous with him is that it has nothing to do with chance. 6:25 And he's such a great guy – we already witnessed it in Marseille for instance – he is very « friendly » (he says it in english ^^), as we say - he approaches the people and talk to them. He's not at all in a bubble. 6:34 And here is his entourage from Toronto, where he's training. It's quite the factory, tat Brian Orser created there. 6:52 98.39, he's second. Not by far, not by far. 7:03 I don't know either what the deduction point is for. I must say that I'm a bit perplexed too, like the three of them. I don't know, I have no explanation. But, well. He's second, And not far from the first.